The Psalms reveal to us how we are to pray and how God answers our prayers. The prayer book of the Bible contains the requests and praises from God’s people as they travel the road of life. As we encounter the Psalms, we become aware of the joys and tumults of life—things that open the mouths of God’s people to praise him as well as things that open those same mouths in lament and frustration. The Psalms stand as the open invitation to all to call upon the Lord with raw reality and unfettered hope. One of the most difficult things for some to do is pray. What should we say to God and how should we say it to him? The Psalms give us a beautiful testament to the freedom we have in our approach to God. Furthermore, the Psalms show us that even during the angst we have in our lives, the peace of God in Christ is always present with us. Take for example Psalm 69. The psalmist David begins his plea to God with what sounds like hopelessness. He is in danger of drowning. He is weary. His throat is parched. His eyes grow dim. This all happens as he waits for God to save him. David’s situation doesn’t relent. He is aware of the multitude of his enemies and how they attack him to destroy him. He recounts his weeping and humility. He even asserts his consuming zeal to serve the Lord. In all theses situations, his spirit is filled with uncertainty and angst. Does this sound familiar to you? Do life’s anxieties, pains, and sufferings cause you to question the presence of God in your life? Do you sometimes feel as if your prayers during these trials are going unheard? Do you ever wonder what the point is to pray if God doesn’t seem interested in giving you an answer, a hope, or salvation? All of this can be compounded when we are doing our best to be faithful and obedient to God and his call on our lives. If we were to stop here, we would certainly be overcome by our angst. But in this same Psalm, we see David grapple with his angst and not stop until peace prevails. The peace of God resounds throughout the Psalm. As David seems to be filled with despair, his constant cry to God is filled with reminders of God’s faithfulness and steadfast love. God is the only one who can deliver him from his tribulation. He looks to no other for his rescue. As the Psalm ends, David is filled with the assurance of God’s power and ability to rescue him. At one point, he cries, “But I am afflicted and in pain; let your salvation, O God, set me on high!” Ultimately, in the throes of affliction and with the hope of salvation, David rejoices and worships God for his mighty strength to save. God has given David his word and David trusts in that word regardless of his situation. In our celebration of the birth of Christ, we must remember that God has given us his Word in the flesh. As we live, we have the hope, love, joy, and peace that can only be given by Christ. May we not neglect to keep our eyes upon Christ no matter how dire our situations. We will have times when we are under attack and seemingly ignored by God. But remember, we are never ignored by God. Jesus is the proof that God is always with us. He took on flesh and encountered the very enemies and angst that we battle. He defeated these threats and gives us his peace. So, as we end one year and begin another, may we never give into our angst and instead embrace the peace we have in Christ Jesus our Lord. “For God will save Zion and build up the cities of Judah, and people shall dwell there and possess it; the offspring of his servants shall inherit it, and those who love his name shall dwell in it.” In the name of the Father, the Son, and the Holy Spirit. Amen. The spiritual discipline of meditating on Scripture can be intimidating. Why should we do it? What comes from it? How do we do it? How do I overcome the difficulties of meditation on Scripture? These are certainly four pressing questions to anyone who desires to dwell in the Word of God faithfully and hear God’s voice each day. First things first. You do not need a bunch of books or education to begin meditating on Scripture. All you need to begin a daily routine of meditation on Scripture is time, a bible, and perhaps a journal. A final important aspect one will need for meditation on Scripture is a community to walk through God’s Word faithfully with you. This final component is neglected many times when we begin to meditate upon Scripture. However, it is of immense importance because it creates a relationship built upon a common reflection on God’s Word and it can help prevent faulty readings and interpretations of Scripture. Bonhoeffer answered the four questions I listed above by sharing how he meditated upon Scripture and offered up prayers each day. Bonhoeffer believed that Christians should meditate upon Scripture first and foremost because they are Christians. If we say we follow Jesus Christ, then it is imperative for us to know how Christ calls us to obedience. It is in Holy Scripture that we hear God’s will for our lives—how we are to love God and love others. He also believed that we should expect transformation from our meditation on Scripture. As the people of God read and allow God’s Word to penetrate their souls, they understand the reality of Christ living within them. When we meet with Christ each day before we meet others in the world, we will be strengthened by the grace of Christ for what we will experience. The final two questions help us to understand how we are to go about meditating upon Scripture. Bonhoeffer believed that the Christian should be concerned with the quality of their time with Scripture over the sheer quantity of reading a text. For Bonhoeffer, a Christian should spend an entire week meditating upon the same ten to fifteen verses of Scripture for at least thirty minutes a day. 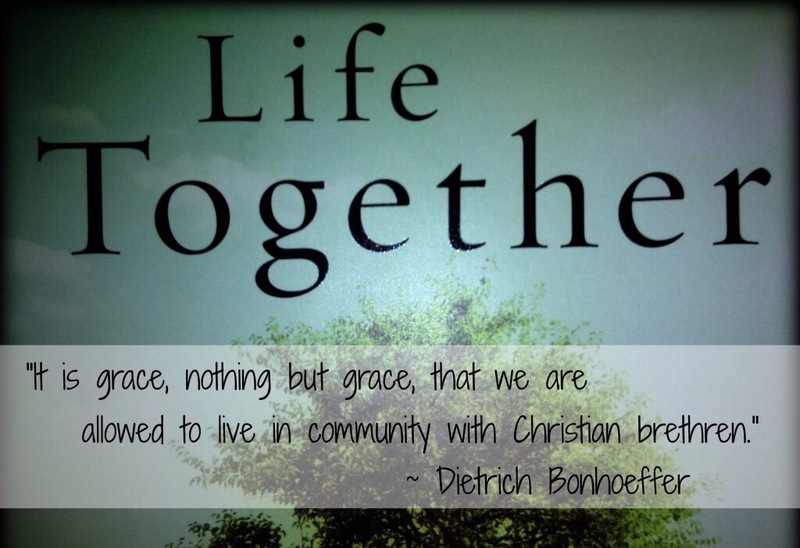 This repetition may not make sense to us, but for Bonhoeffer, when we allow our hearts to meditate upon the individual words of a small set of verses, then we would be more aware of their power and meaning for our lives. One may begin to feel their heart or mind wander as they meditate upon those texts, but we should engage that wandering and allow it to be the fertile ground for our prayer life. We may perceive that our wandering mind is a problem—but it is not a problem. It is the occasion for prayer. As you read and ponder a text, a family member or a friend may appear in our mind. We must take that opportunity to pray specifically for them as we meditate upon the text. Through this discipline, we are understanding the grace of God and seeking it for our lives and the lives of others. Most importantly, be patient and faithful in your meditation. One may believe that thirty minutes is too much time to devote to such an exercise, but as we all know, time in God’s word is never a waste. Don’t let the frustrations of life cause you to miss hearing the life-giving word of life that we have through Jesus Christ. Amen. It&apos;s back to school time! As teachers and students begin a new school year, we all get a reminder of the joys of learning, friendship, and early bedtimes. I am grateful that my three kids are much more successful at making friends than I was when I was their age. Ava, Braden, and Drew were happy to go to school today in large part because of their friendships and the value they see in what they learn in school. It is amazing how elementary school children understand, in their own ways, of course, relationships and the value of what they are learning. What&apos;s more amazing is how we adults forget both of those aspects as we live our lives. Since its back to school time, I was pondering the importance of Sunday school to my life as a pastor. I know that, in general, over the last few years, Sunday school has fallen out of fashion in favor of "life groups", "small groups", "home groups", or other inspiring groupings of people. Be it Sunday school or "awesome sauce life group", the purpose remains hopefully the same–a faith community for people to gather around the Word of God in order to deepen relationships with one another and understand the eternal truth of Jesus Christ. This is called discipleship. Usually people will stop attending Sunday school if it doesn&apos;t provide meaningful, Christ-centered relationships or if it doesn&apos;t contribute any type of meaning or purpose to our lives. When this occurs, it is a mournful thing because the community of Christ should be built around the relationships that God has knit together focused upon the testimony of God for us in our world. We need each other more than we realize. "God has put this word (the Gospel) in the mouth of men in order that it be communicated to other men. When one person is struck by the Word, he speaks it to others. God has willed that we should seek and find His living Word in the witness of a brother, in the mouth of man. Therefore, the Christian needs another Christian who speaks God&apos;s Word to him. He needs him again and again when he becomes uncertain and discouraged, for by himself he cannot help himself without belying the truth. He needs his brother man as a bearer and proclaimer of the divine word of salvation. He needs his brother solely because of Jesus Christ. The Christ in his own heart is weaker than the Christ in the word of his brother; his own heart is uncertain, his brother&apos;s is sure." Sunday school (or Awesome Sauce LG) provides us with the opportunity to come together as brothers and sisters who are navigating through life clinging to Christ and needing to hear that someone else is trodding that same path with us. In our discipleship we can encourage one another, rejoice together, pray together, mourn together, work together, sing together, and commune together. And with this communion in the name of Christ, we get Jesus. So, may we always understand the importance of our relationships and the value of our fellowship each week as we meet together for worship and discipleship. For when we gather each Sunday, Christ is present with us and nourishes us for the lives we&apos;ve been called to live. Amen. This morning as I was driving to the church I heard a song that I had heard many times in my life, but it was like this morning was the first time I REALLY listened to the song. The band Incubus is a hard rock band that I am sure most of you have never heard of, but their song “Wish You Were Here” intrigued me for some reason. Boyd longed for a connected community with substantive friendships that celebrated their time together making that album. He was reflecting what so many people desire: joy-filled hope within a community of people with shared experiences and life together. As we prepare for Sunday, know that God will be placing you this week in places surrounded by people who long for a genuine relationship. The Holy Spirit stirred within Cornelius a desire to belong in the fellowship of God. Had Peter maintained his stubbornness about who was worthy of hearing the Gospel, Cornelius and other Gentiles in Caesarea Maritima may never had heard the Gospel (or maybe they would have, who knows?). But it is not a question we have to answer because Peter was obedient to God’s call and faithfully went where the Lord led him to carry the Gospel to all the world. As a result, people were added to the family of the Lord and all had the community gifted to them by God so that they could all share the joy-filled hope of Christ Jesus. Are you obeying the call of Christ and faithfully pointing those entrusted to you by God himself to know Christ and enjoy him forever? If you are reading this and are looking for a genuine community of faith, we wish you were here. We have a place for you at Homewood CPC! We have a place for you at Homewood CPC. That is not just a nifty catch phrase. It is the reality in which we live. Homewood CPC is a place that literally has a place for you. In so many ways, churches and organizations want you to come in and adapt to their standards and guidelines. At Homewood CPC, we truly believe that God has knit this community together knowing that every person who comes to Homewood CPC has a place to exercise the gifts given them by Christ Jesus. We are a place that values the gifts of God in the people of God. This means that we need you. It is so easy for us all to forget this reality. Whenever we have a worship service and you are not in attendance, the body lacks. Whenever we have a bible study or fellowship dinner, we truly miss those who are absent. God created us to be the body of Christ and to live fully together to the glory of His name. Let us never neglect this calling, for when we neglect it, we neglect God and His Word. Sherrad and I hope to see you all this Sunday. We both know that life can be busy. But we also know that the life rightly ordered is anchored in the person of Jesus Christ. Jesus Christ is the Way, the Truth, and the Life. Should we all not make it our priority to encourage one another as we follow Christ together? As we encounter the busyness of life, may we encounter it together. The witness of Acts is clear: when the Christian community faithfully gathers with one heart and one mind to study the scriptures, to break bread together, to pray with and encourage one another, and to care for one another in our times of need, God adds to the number of that community. If you don’t believe me, check out Acts 2 and Acts 4. This is our call. This is our desire. This is our purpose. At Homewood CPC, we have a place for you. If you haven’t attended in a while, we invite to come claim your place and let’s see how God grows us for the glory of Christ Jesus. Defining moments in sporting events are critical. During the 2016 World Series, the Cubs and Indians played a classic series that led to something no one ever thought possible–the Cubs won the World Series. As a lifelong Cubs fan, I had endured 32 years of disappointment and jokes directed toward the “lovable losers” of baseball. But 2016 was different. A team filled with young talent and wise leadership made the most of their opportunity and took charge of the moment at hand. When Game 7 began, the Cubs opened the game with a lead off home run by Dexter Fowler. Later in the game, the old veteran David Ross cracked a home run. As big as those two moments were, they were not the defining moments of the game. No, the defining moment of the game came not because of a stellar play on the field, but instead, when the rain began to fall after the 9th inning ended with the game tied 6-6. I truly believe that the Indians would have won the World Series had that rain delay not happened. What was the defining moment? During the rain delay, another veteran who had struggled with his bat during the entire postseason, Jason Heyward entered the locker room with his Cub teammates and delivered and impassioned speech that reminded the team of who they were and what was on the line in that game. He appealed to the team’s sense of purpose and talent. He reminded them that they had what it took to finish the game and end a 108 drought for the “lovable losers”. When the game resumed around 20 minutes later, the Cubs came out and scored two runs in the 10th and held on to win the series 8-7 over the Indians. The defining moment of the World Series was a speech during a rain delay from a struggling veteran. Incredible. As we live our lives, we have defining moments. These moments are important for us as we attempt to navigate this life of faith. On Sunday mornings at Homewood CPC, we have opportunities to come to church and hear a message from God’s Holy Word reminding us of who we are, who God is, and what God has done for us and called us to. The sermon each and every week hopefully provides each of us with the truth of Jesus Christ in order for us to finish well. Paul often times refers to life as a race, and he encourages us all to finish well. If we want to finish this life well, we must focus upon Christ and his call for all our lives. Any person who stands in the pulpit at Homewood CPC is aware of the importance of the centrality of the defining moment in all of creation. This defining moment is Jesus Christ. How do we respond to him? I think I can speak for both Sherrad and myself here, but we know and understand that every sermon cannot be “the greatest sermon ever preached”. We wrestle and struggle each week with obediently proclaiming the Gospel to a community of faith in an imperfect world. Through all our weaknesses and limitations, we always strive to proclaim the only thing worth proclaiming–Jesus Christ and him crucified. As a result of that truth, we hope to lead and equip the members of HCPC in the faithful execution of Christ’s commands. We are called to love one another more and more. We are called to share the love of Christ with all we meet. We are called to worship and know our place in this world. And we are called to trust in Christ alone for our salvation, our purpose, our strength, and our all. What will we do with the defining moments on Sundays? Only you can answer that question. Ephesians is a rich letter from the Apostle Paul to his brothers and sisters in Ephesus. Written around 60 AD, Paul gives us a beautiful look at how orthodoxy (right faith) leads to orthopraxy (right living). The operative phrase in the entire book is “in Christ” (or some formulation of that phrase). Ephesians leaves us zero doubt that sanctification (being made holy by God) and justification (being declared righteous) is only in Jesus Christ. One way to remember this is by paying attention to how many times Paul uses some form of “in Christ” in his letter. He wants the reader to never forget that it is only in the person of Jesus Christ that we have any hope for relationship with God. Our relationship with others flows from this restoration we have to the Father by Christ Jesus. There is nothing we can do, say, or think that can get us into right relationship with God. The late Adrian Rogers once said in a sermon, “I wouldn’t trust my best fifteen minutes on earth to get me into heaven.” It is only in Christ alone that we have any hope to defeat sin and death. Lutheran theologian Walter Obare Omwanza has stated that “the unity of the church is given by God and not an achievement of human beings.” Omwanza rightly identifies that Paul is proclaiming that unity of faith is only possible in Christ Jesus. No human action can create the true unity that humanity desires. Omwanza echoes the prayer of Jesus in John 17. In John 17, while in the Gethsemane, Jesus prayed for unity of the disciples. This unity was not to be for the sake of unity alone, but it has deep theological significance for the world. The unity of the followers of Christ will provide a witness to the world that Jesus is the Messiah, the Son of God, the One who has defeated sin and death for all time. Unity is not a wish dream nor is it an ideal. It is a reality found only in the Triune God that communicates the gospel in a mighty way. In verses 1 and 2, Paul opens his letter by addressing the people of Ephesus as saints. Many times we do not think of ourselves as saints. We often times think that a saint is a perfect person who does most everything correctly. However, the Bible teaches us that everyone who trusts Jesus Christ as Lord and Savior, even though we are imperfect, are God’s saints. These folks in Ephesus were faithful to Christ and that is the only requirement to be considered a saint. Therefore, in Christ, fallen humanity has hope and assurance that we are all saints with a purpose to glorify God. Jesus. Verse three begins with worship as Paul blesses God the Father because of the work of Jesus Christ. The Father of Christ has blessed us in Christ with every spiritual blessing. In verse four, we learn that God chose us in Christ before the foundation of the world. Also in verse four we are implored to to be “holy and blameless” before God. This is an impossibility apart from Jesus Christ. We are clothed in Christ and when God sees us he no longer sees enemies, but rather his children. The love of God has predestined us for adoption as children of God. It is for God’s purposes alone that this is done. God has blessed us in his grace in Christ. We have redemption in Christ and forgiveness of our sins. In the person of Christ, God has lavished all wisdom, grace, and insight upon us. Christ is the assurance for all time that we have been reconciled to the Father in heaven. Not only have we this assurance, but we also have an eternal inheritance in Christ Jesus. All these blessings we have in Christ ought to cause us to worship and serve God with faithful hearts. It is the Holy Spirit of God–the same Spirit that raised Christ from the dead–that inhabits all of the children of God and creates within them the faith that leads us to Christ again and again and again. These opening verses reveal the foundation of our lives in Christ Jesus. No matter where we are or when we are, we have reason to worship the Triune God. This is better than good news–it is the Gospel. I would be remiss if I didn’t take a moment to address the elephant in the room–election. The concept of God choosing and predestining his people for these eternal blessings cannot be ignored. What does he election mean? The Cumberland Presbyterian Church was formed because our first ministers rejected the idea of election and double-predestination. As I see it, we cannot avoid predestination as Cumberland Presbyterians because the Bible uses those words and teaches those truths. However, we have to understand what it means for God to elect his people for salvation. Forgive the brevity and simplification of the next two paragraphs as the doctrine of election is a deeply nuanced doctrine. One explanation of election focuses on the decree of God. Briefly, this explanation teaches that God has determined and decreed who will specifically be saved. God has predetermined his elect and it will be done. An alternative to this view of predestination by decree is that God has predestined his people in Jesus Christ. Karl Barth tells us in his Dogmatics II.2, that Jesus Christ is both electing God and elected man. And because of this reality of Jesus, he has the final word over the fate of his creation. This makes the central question of election not “Who are God’s elect? but rather, it is the very question Jesus asks his disciples in Mark 8–“Who do people say that I am?” Election and predestination is in Christ alone. Therefore, whenever God’s elect is asked the question “Who is Jesus?”, their answer is this: The Son of the Living God; the Messiah; the Savior of the World; the Lamb who takes away the sin of the World; the image of the invisible God. Those in Christ’s flock know his voice. His is the voice of our Lord and Savior. Who do YOU say Jesus is? These first fourteen verses prepare us for an encounter in which we can understand the truth of our God. Jesus Christ is the foundation of our being. Unless we recognize the truth of who we are in Christ, we will never find the promised rest our hearts so desire. Amen.